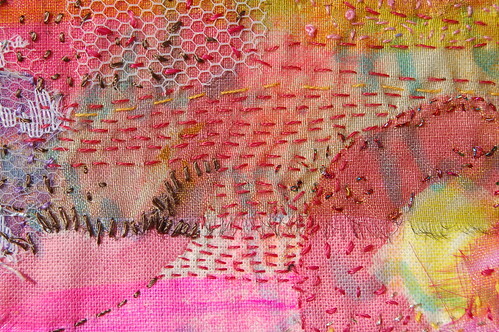 Fly photo over a Inner Landscape II, mixed media embroidery by Hanna Andersson. It has paper, plastic netting, acrylic paints, fabric, lace and all kinds of stuff in it, but most of all tiny stitches. 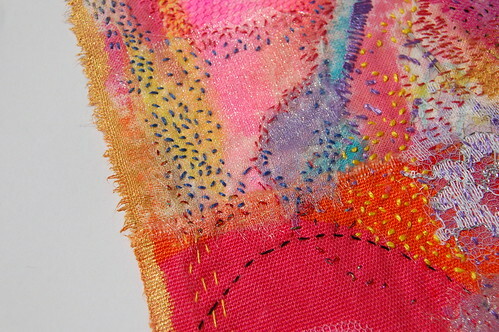 Lots and lots of my tiny hand sewn stitches spread across the surface. Adding colour and texture. Adding me-ness to my work. Please leave a comment if you like it. And have a closer look below, I think there is much to look at in this one! 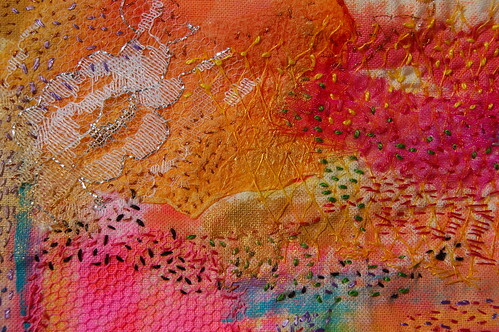 This entry was posted in Art Experiments, Fabric Art and tagged embroidery, free form embroidery. Bookmark the permalink. Wow! so beautiful! 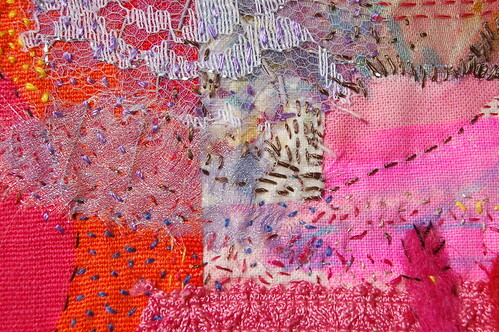 I love the pink and ALL the texture…I love the three pieces of yarn? sewn at the bottom of the piece. You put a lot of work and time into it, and it shows! Love it!!! Hanna! Your piece is so lush and beautiful! Love it!!! 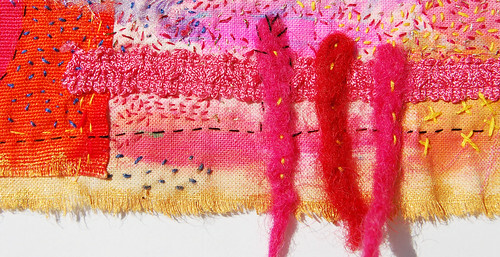 How does your creative process work when you do mixed-media embroidery? So you start with a blank “canvas” of sorts and just start adding to it – or do you have a central image that you base it on? 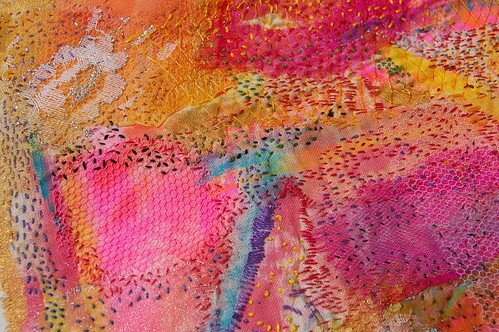 Your work reminds me of Julia Capara’s but more colorful and much prettier. Love all the thousands of stitches! this embroidery, i think, sums up exactly how the summer is: bright, hot, blazing, colorful, with occasional hints of blue and green (at the ocean or in the pool.. or in tall cups of cold water). it’s beautiful, hanna! Lovely, lovely, lovely. This piece is so beautiful and inspirational…thank you for sharing it with us. 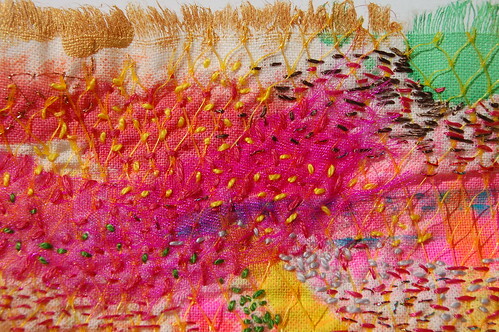 I wanted to tell you about an embroidery artist that you might find interesting…Susan Sorrell. (www.creativechick.com). I have taken one of her online classes (organic design) and it is really amazing as it gets more into the creative process than the finished outcome. You might like her work and her ideas. Yours is the first blog I check every day. Thank you so much for feeding all of our creative souls. Add me to your fan list! I am in love with your work….Thank you for sharing the extra close detail….so many million stitiches….I think of summer zinnias and dahlias….blooming now at the height of summer….I owe you an extra thank you for your Evidence pages…..You single handedly got me “moving” out of a major dry spell….I am so very grateful that you spend so much time sharing your energy with others…. Mmmmm! I love the colors and the stitching. You have totally inspired me to take up embroidery as a hobby. I want to start dying my own threads next. Thanks for being so awesome! Amazing and inspiring! Can’t look at it and not smile at all the bright and happy colors! Amazing work! your work simply makes me sigh….beautiful! This is a beautiful work of art, love all those tiny stitches!!!! Hi Hanna! I love this piece…a true work of art! How big is it? Can I commission you to create one like it for my home!? :-) I cannot stop looking at it. 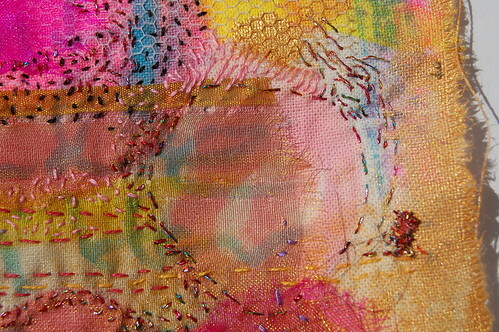 Your stitched piece is so wonderful! Love it Hanna! 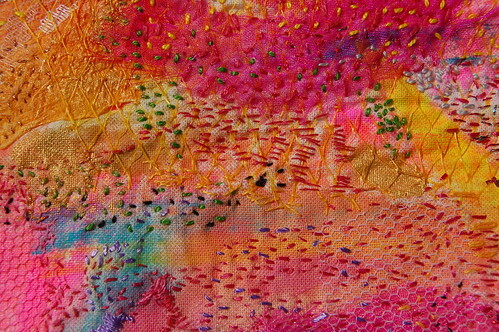 Wow, thank you all for your lovely comments on this embroidery! Reading your comments makes me so happy, thank you! Amy, thanks for the link. 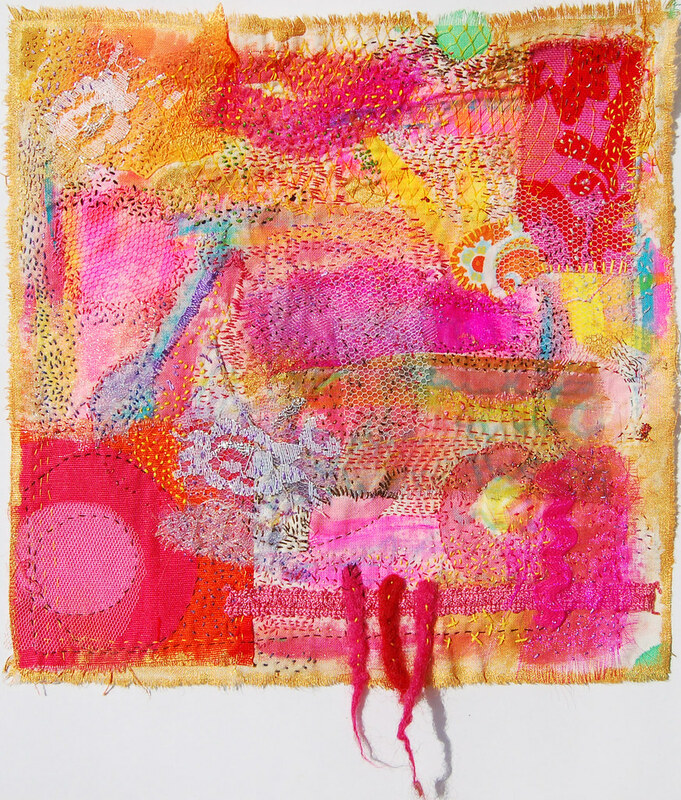 I know of Susan Sorell’s work and I am a big fan of her colourful expressions! I would love to take a class from her sometime. Jo, wow, are you comparing me to THE Julia? Haha, I’m am very flattered indeed! Sarah, thank you for commenting! I don’t think I could create something like this on commision, but I have created two pieces that are in pink hues, I will post about the other one later in September. One of them will be for sale, so if you are interested please contact me about it. Thanks. It’s really interesting Hanna! I like it. Good work! Thank you for posting these photos/sharing your work. I’ve been wanting to do something like this and you’ve inspired me to get going! Perfect timing with winter coming on. I love this embroidery and find it very inspiring. I am just taking up embroidery again and am in awe of such beautiful work.